I am one of those girls that is always craving long hair but can never seem to grow it. With all the dying my hair is damaged and will never get much further than my shoulders. Hair extensions aren’t always the answer as they become a pain to wear everyday. 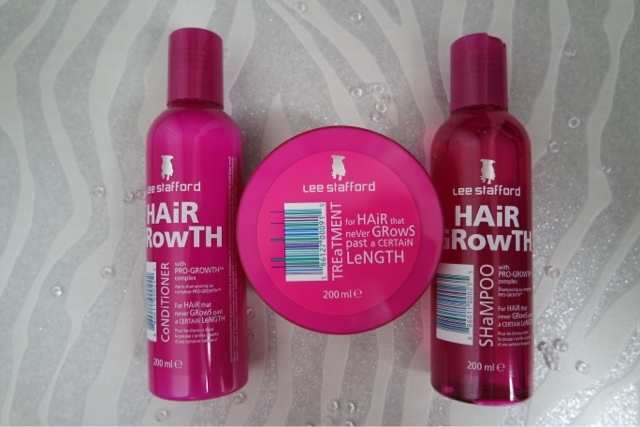 I came across a hair growth range by Lee Stafford and wanted to see if it really worked. Two things that drew me towards these. The words HAIR GROWTH and the fact the packaging is bright pink! I have been using the shampoo and conditioner for the last few weeks and I have been doing the treatment every few washes. The treatment is used between shampoo and conditioner. Once washing your hair you put this on your whole head (and scalp), I usually leave for like 10-20 mins whilst I relax in the bath, then you wash it off and apply conditioner as normal. All of the products smell great but the treatment has the best scent (and it is also pink!). Its hard to tell if things like this work but as I have blue hair I can judge easy by my roots. I think this has helped but I don’t know how?! My hair is softer and feels in better condition (hopefully wont break off, this will help it grow!). I do believe it somehow works though as my roots are really bad!